Ah, the English countryside in winter. So empty, so picturesque, so unbelievably wet! We spent most of Sunday eating, drinking or curled up by a roaring fire at the beautiful Bibury Court Hotel in the Cotswolds whilst it chucked it down outside. I pitied the poor trout in the River Coln, swimming hard against a torrent of water so fresh and clean you could still see right the the bottom. The celebration was all in aid of my birthday (most things are this year!) and very lovely it was too. I could have stayed the week….or just moved in. Then this morning we woke to a light covering of snow – fine and white and clinging to every branch and twig. I have rarely seen the Cotswolds look more magical. It was all going so well, until I managed to fall flat on my face climbing a muddy bank, at the same time impregnating my camera with wet, gritty earth and tufts if grass. Not to mention the dirty knees and damage to my pride. One large tub of cotton buds and copious delicate swabbing have just about restored the camera. My aching ribs might take a bit longer to recover. Below, Arlington Row, Bibury, one of England’s most iconic terraces. We were much smaller in those days! Anyway, whilst I was still vertical, I managed to get a few snaps of the flower of the moment, Galanthus nivalis, the snowdrop. 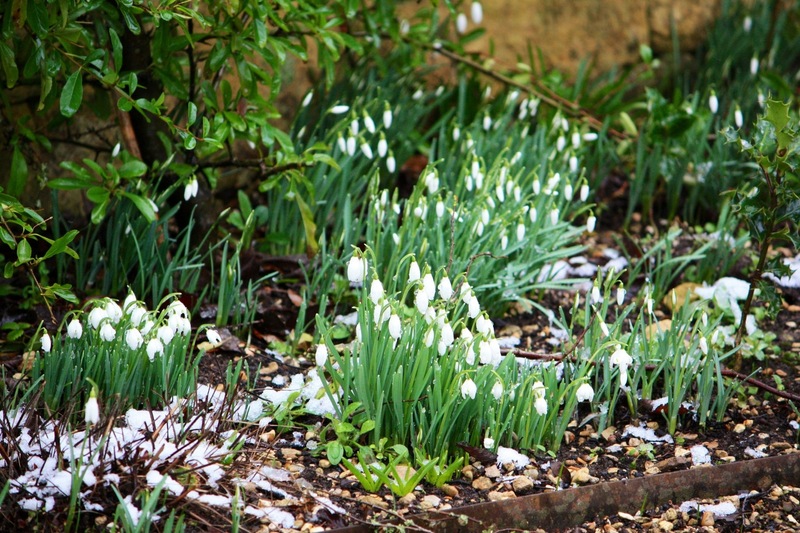 The British are currently obsessed with snowdrops, in the same way that the world was with tulips once-upon-a-time. Bulbs change hands between enthusiasts (known as Galanthophiles) for hundreds of pounds. I don’t get it myself – a bit too “emperors new clothes” for me – but I share the appreciation of these little flowers’ simple beauty and the expectation they bring that spring is just around the corner. 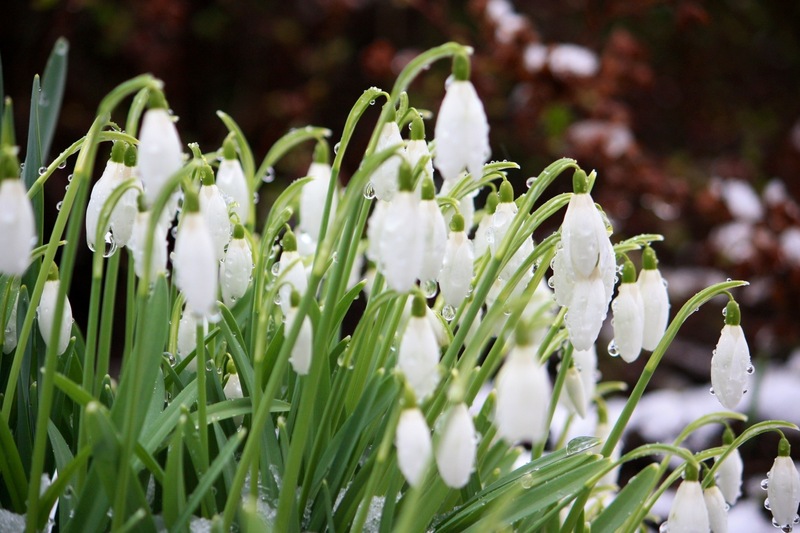 Although they carpet the woodlands in these parts, snowdrops are not in fact native to the UK. They hail from a large area of Europe extending from the Pyrenees to the Ukraine and only arrived here in the mid Sixteenth Century. 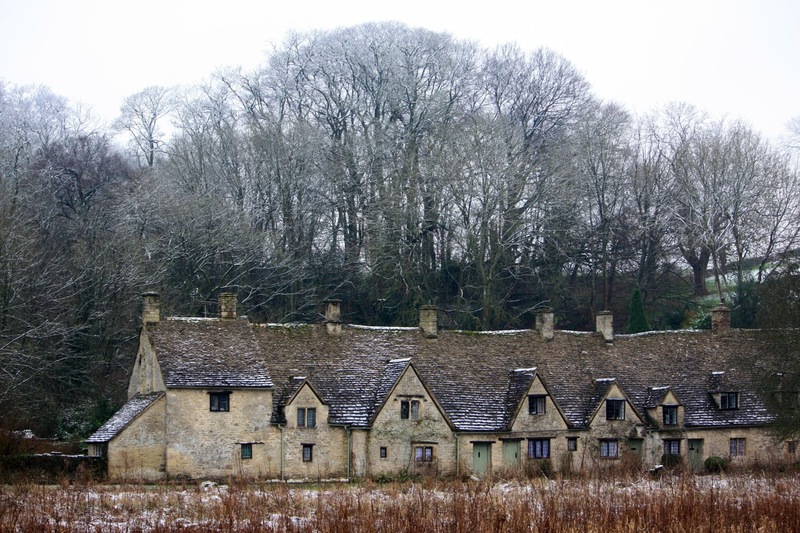 Bibury Court would still have been a monastic building at that time. Snowdrops enjoy dappled shade, but here in the Cotswolds they line the foot of stone walls, peep out of rockeries and emerge pure and white from the mud. Shame I didn’t follow their example ;-). 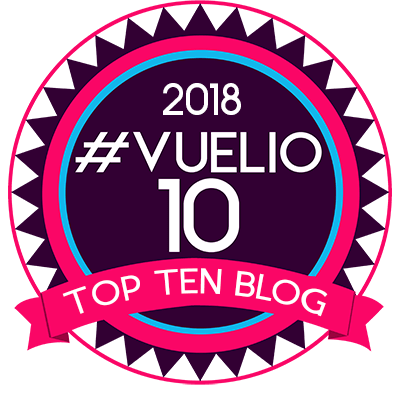 I’ve been snooping around looking at how you’ve put together your new-look blog, reading about your theme (it took a while to figure that ‘Customised Further’ didn’t quite mean what it seems 🙂 ) I am really impressed, and more than a little envious. It is time to upgrade my blog theme, but I don’t have the time right now, or, frankly, the resources to get exactly what I want. Meanwhile you’ve showed me that it CAN be done. Here’s wishing you joy with your blog!